GettyElon Musk and Kanye West. During an interview at South by Southwest on Sunday,Elon Musk said he was “obviously” inspired by the rapper Kanye West. The tech entrepreneur previously wrote a blurb for West’s inclusion in Time magazine’s 100 Most Influential People list in 2015. 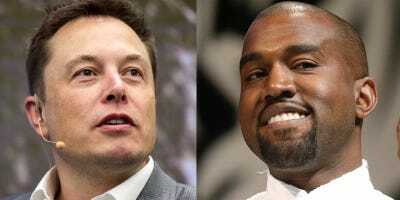 The billionaire tech entrepreneur Elon Musk lists the rapper Kanye West as one of his inspirations. “Well, Kanye West, obviously,” Musk quickly replied, to an eruption of laughter from the crowd. While Musk’s mention of West evoked laughter from the festival audience, the Tesla CEO has had a history of praising West’s career.